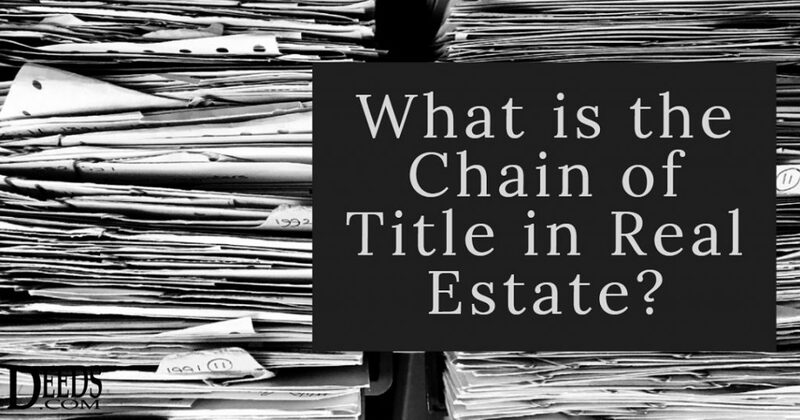 What is the Chain of Title in Real Estate? In real estate, the chain of title is the history of the property’s ownership. When a property is sold, the title is transferred, and these transfers form the chain. Researching the chain of title is among the tasks performed by a title company when a buyer signs a contract to purchase a property. The chain of title for any property is found in the relevant county recorder’s office, and there’s no reason you can’t conduct your own search to determine the chain of title. All the information is in the public record. Keep in mind that state laws governing the recording of real estate transfers differ, so the chain of title process in one state may differ somewhat from the chain of title process in another. Transfer documents (deeds) document the transfer of ownership. The deed conveys the property from the seller, or grantor, to the buyer, or grantee. The deed also includes a detailed description of the property. Financial documents (mortgages and deeds of trust) are voluntary liens, as the creditor enters into an agreement with a lender to borrow money to purchase the property. Until the debt is paid off, generally in 15 or 30 years, the lender has title to the property. Once the mortgage is paid, the former creditor owns the property “free and clear.” The date of the mortgage or lien determines which lien is a priority for payment if there is more than one lien in competition. A deed of trust, also known as a trust deed, assigns the property to a trustee. The trustee holds the title as security for a loan between the lender and the borrower. In such a case, the lender is known as the beneficiary and the borrower as the trustor. Involuntary lien documents include liens, lis pendens and tax liens. Involuntary liens, as the name implies, are liens that arise without the owner’s consent, usually due to nonpayment of debts. Examples of involuntary liens include property tax liens when local property taxes are not paid; income tax liens, for failure to pay the IRS; judgment liens from a creditor, ordered by the court, and mechanic’s liens. The latter is filed by contractors if the owner does not pay for work done on the property. Involuntary liens “cloud” the title and require payment before the property changes hands. In some cases, the property is sold at auction to satisfy the lien. A lis pendens is notice that a lawsuit has been filed regarding the property’s title or ownership. Covenants and restrictions are documents creating restrictions on the use of the subject property. Such restrictions may include limits on the types of improvements made to the property, uses of the property and property occupancy. Older homes may have covenants not permitting the sale of the property to people of certain racial or religious backgrounds, but these covenants are no longer enforceable. Utility easements — allowing utility companies access to the property for the purpose of maintaining electrical lines, water/sewer lines and the like. These are the most common types of easements and affect most properties. Private easements — a private easement allows another party, usually a neighbor, access through the property. It may mean direct access, such as a shared driveway, or non-direct access. An example of the latter is solar access, which means the owner cannot build or plant anything on the property that would affect a neighbor’s solar collection. Easement by necessity — in some situations, the only way a neighboring landowner can access their property is by going through an adjacent property. This is known as easement by necessity, and the property owner cannot interfere with the neighbor’s ability to access his or her land. Death certificates, when the property passes to a joint tenant through the right of survivorship. This joint tenant is generally the decedent’s spouse. Sometimes, there is a break in the chain of title. This occurs if the title transfer was inaccurate – or fraudulent. Human error is often to blame, especially if paperwork is filed in haste. That’s often the case during real estate booms, when lawyers and lenders were simply overwhelmed by the sheer amount of business. Common errors include misspellings of names of the grantor or grantee, incorrect legal descriptions of the property, lack of signatures on the deed, mistakes in when the chain of title documents were recorded, and even filing the deed in the wrong county. When there is a break in the chain of title, correction is necessary. The simplest ways to correct such breaks is to have the property owner go to court and seek quiet title action. Depending on the nature of the break, a judge can rule that the break is not relevant and no longer exists. However, if the break is known to have resulted due to a particular party, the owner can seek out the party and have them fill out a quitclaim deed, which gives up any rights to the property they may have had. When it comes to chain of title and foreclosures, any break in the chain of title is a possible defense by an attorney for a foreclosed property owner. If your house is very old, or if you wish to learn more about the property’s ownership before the house was built, much will depend on your state’s homestead laws. The formal chain of title ends when you can no longer find information on the property’s sale history, but that does not mean it is the true end of the chain of title. For more information, however, you need to become a history sleuth. That development house built in the 1950s sits on a parcel of land – a subdivision – that may have belonged to a farm family for generations. Finding out more may involve visiting your county or city’s historical archives or visiting old cemeteries to look for the graves of former owners. You may also want to check local newspaper archives and immigration records. The bottom line is that the chain of title offers a history of the property and learning that history is often worthwhile in its own right.